1. Someone has told you that you need file a form of probate called a Florida Summary Administration, and you’re searching for an economic and stress free way of accomplishing that. 2. You’ve learned that Florida probate attorneys charge a lot of money to fill out the and file summary administration forms, usually thousands of dollars. 3. You’ve learned that there is more than just “one form” involved in the process, and the process can quickly becoming intimidating. 4. You’ve found one or two “national form banks” type of websites that advertise Florida probate forms for sale, but something doesn’t seem quite right to you. You’re very perceptive. Don’t get suckered in! Florida Document Specialists is a small, family owned company in Central Florida that is A+ rated and accredited by the Central Florida Better Business Bureau. We offer non-lawyer preparation of document packages for Florida Summary Administration Probate proceedings, and we serve the entire State of Florida. Your personal document preparer will be readily available to you by phone or email until your process is complete. Click here to learn more things that distinguish our company from the rest. We change $495 for our service payable in two payments. You will never be asked to pay us more. We collect a $247.50 deposit to open your file and prepare your probate forms. The the balance is due after you’ve signed, notarized, and returned your Florida summary administration documents and before we file them with the court. You can read more about our payment policies here. Yes. To file a Florida summary administration of probate for an estate valued at $1000 or more, the average filing fee in Florida is $345. Ancillary proceedings may cost $400. Although we file and monitor your case for you, the court filing fee is not included in the fee we charge for our services. Whether or not you choose to hire Florida Document Specialists to assist you with your summary administration probate project, we have assembled some frequently asked questions below that may help you with your research. Contact us at anytime using the contact form at the bottom of this page or simply by calling. 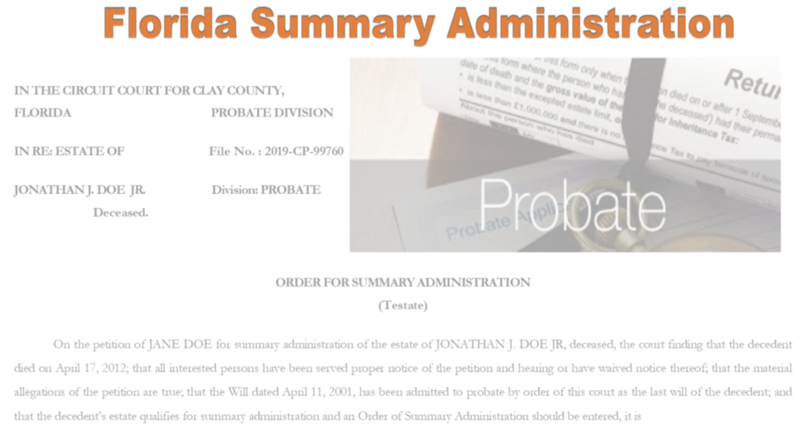 What is a Florida Summary Administration Probate Process? Probate is a process supervised by the circuit court, which identifies a decedent’s debts and distributes the decedent’s assets to the beneficiaries. Florida Summary Administration is a shortened form of probate that requires less time and effort than formal administration. Unlike formal administration, the probate proceedings in a summary administration don’t require a personal representative, and the court will not appoint one. Can I Really File a Summary Administration in Florida Without an Attorney? In most Florida counties, the court will accept a petition for summary administration from a pro se (self-represented) party without requiring a lawyer. If you do an internet search on this topic, you will see probate attorneys themselves arguing about this. It seems that either some of them don’t know this, or maybe they just think it’s bad for their business. Florida judges sign numerous orders for summary administration each year prepared and filed by pro se parties who did not use a lawyer. A Formal Administration of Probate in Florida requires the services of an attorney. What if I Don’t File the Correct Forms and Proposed Orders? The probate clerk in your county court uses an intake checklist. Unfortunately, this checklist varies somewhat from county to county. If you intend to prepare and file the forms for a summary administration of the decedent’s estate on your own, your primary focus should be to satisfy the court. The probate clerk will compare your petition for summary administration and its supporting documents, proposed order of summary administration, and all of your other probate forms and documents against their summary administration probate checklists. They will also check to see if interested parties were given proper notice of your petition for summary administration. If something is wrong with your probate paperwork, it is possible that it could be rejected and returned to you without further explanation. Probate clerks are not permitted to tell you what you are missing or how to correct your mistakes. Is the Estate Eligible for Summary Administration? The value of the entire estate subject to administration in Florida, less the value of property exempt from the claims of creditors, must not exceed $75,000. If the decedent’s Last Will and Testament directs a formal administration of probate, the option of filing a summary administration becomes unavailable. The estate must be probated with a formal administration using an attorney. To begin a Florida summary administration, the petitioner obtains the required Florida summary administration forms and files a Petition for Summary Administration with the circuit court. The Petition for Summary Administration may be filed by any beneficiary or by a person selected as a personal representative by the decedent in a Will, but it must be verified and signed by the surviving spouse, if any. How Do I Know What to Put In the Forms? Florida statutes specify what information must be included in the petition for summary administration. These include facts showing why the estate qualifies for summary administration, and information about the estate’s assets along with a proposed plan to distribute them. Summary administration in Florida is governed by Chapter 731 of the Florida Statutes. It is commonly referred to as the Florida Probate Code. What is The End Result, and How Long Does it Take? Once the judge reviews the petition and is satisfied that the estate qualifies, and the requirements of the law are met, the court will issue an order(s) distributing the assets. Processing time in the court is unpredictable and depends on things such as the size of the county, the workload and efficiency of the court, and even the time of year. We have seen pro se parties receive signed orders in as little as two weeks after filing or as long as 7 months. Yes. Just because an estate qualifies for a summary administration, it is not necessarily a, “no-brainer” to choose this course of action. There may be some circumstances in your particular matter that you did not anticipate. For instance, in a Florida summary administration, there is a petitioner, but no personal representative. A petitioner does not have the same legal authority to inquire about, collect, manage, or dispose of assets in the same way that a court appointed personal representative does. You may think that the estate is valued at under $75,000, but there may be bank accounts, stock accounts, or other assets that you are not even aware of. You will not have the authority to inquire about the possible existence of these assets, and banks and other institutions have no responsibility to disclose them. Probate can be a complex area of law. That is why there are attorneys in Florida that specialize in probate. Probate matters often require a Florida probate attorney, not a document preparation service. There are other factors that may come into play too, such as IRS issues, lawsuits, homestead exemption concerns, and foreclosure proceedings, to name a few. That’s why it’s always a good idea to locate and consult with a Florida probate attorney to answer your legal questions so that you can feel confident that you are making the right decisions. If you decide to file a Florida summary administration case on your own, and you don’t require legal advice or representation, Florida Document Specialists can provide you with affordable clerical and procedural assistance in the preparation and filing of all the required Florida forms for Summary Administration. If you’re ready to get started, you can complete our online summary administration questionnaire. The questionnaire gives us the information that we need to complete your Florida Summary Administration forms.